"I need to share a Word document with several co-workers. Is there a way to make a Word document read-only, so my co-workers can see the contents but can't change docment?" Microsoft Word and other apps in Microsoft Office allow you to make read only files. Keep in mind this only prevents someone changing the read-only version of the document, not preventing them from saving a copy of the Word document and changing the copy. To make a Word document read-only follow a few simple steps. Word includes a feature to finalize your document, which will make a Word document read-only. To access this feature, click on the Office menu button at the top left of the Microsoft Word screen, choose Prepare > Mark as Final. You will then be given a couple of prompts to verify that you want to finalize your Word document and make the document read-only. 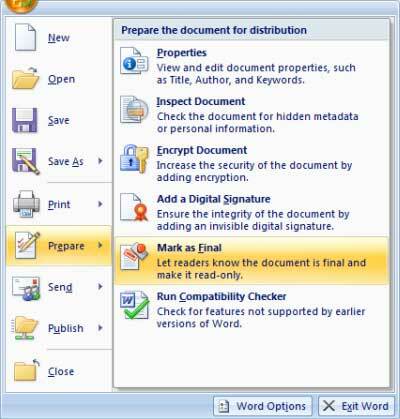 After completing these steps, the options to edit the document will be disabled. If you need to edit the document later, you can re-enable editing by clicking on the Mark as Final option and reversing the process.